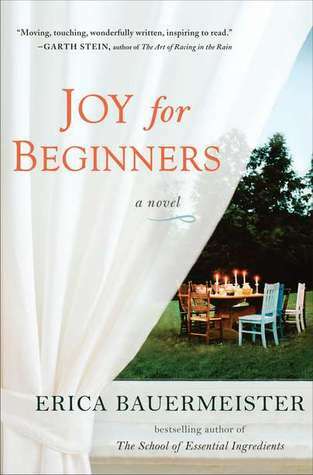 Joy for Beginners is less of a novel and more of a series of short stories woven together through Kate, the character who hosts a dinner party for her friends to celebrate the winning of her battle with breast cancer. At this dinner party, Kate challenges all of her friends to complete a task that they have always feared doing - but Kate gets to choose their task. The premise behind this book sounded right up my alley. A book where characters must look at their lives, take a risk, and address a fear? Talk about easy character development, right? Unfortunately, I think the writing got in the way a little bit. The entire book was so lush and dripping with details, that it became more about the descriptions and less about the story or the characters. I found myself forgetting everything about the characters from previous chapters due to the overwhelming descriptions. I also never really felt the fear behind the women who had to complete these particular tasks. Bauermeister's penchant for writing descriptions that are extremely sensory and sensual didn't really translate the fear these women were feeling. Having said that, there were stories in this book that I did find endearing, and reading it wasn't an unpleasant experience. I just wanted the author to tell their stories rather than bogging them down with so much description. I think there has to be fine balance of details and storytelling. Doesn't look like it was so balanced here. Thanks for the introduction and for the honest review.